Much has been spoken of the incompetence of India’s defence manufacturing capability. But one would be surprised to know that India’s first jet aircraft, Marut (means ‘Storm’ in Sanskrit) was manufactured domestically. In fact it is the first jet aircraft manufactured in Asia. It was supposed to be a supersonic aircraft, but it did not achieve the speed due to problems with the engine. In spite of that, it served India well till 1982 when it was replaced by MIG 23N. Marut was completely phased out in 1990. Kurt Waldemer Tank, was an aeronautical engineer who designed many aircrafts for Luftwaffee (Air force of Nazi Germany). He was famous for his work in Focke Wulf aircrafts that were used by Germany in WW II. Before leading the Marut project, he was working in the Madras Institute of Technology where APJ Abdul Kalam was one of his students. He finds a mention in Abdul Kalam’s book ‘Wings of Fire’. He was invited by Jawaharlal Nehru to design the aircraft. 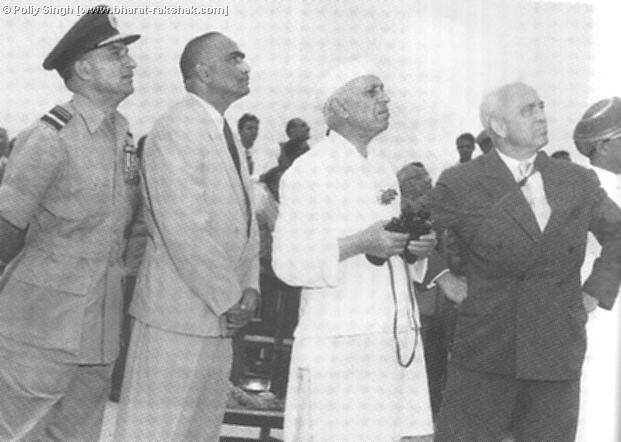 Nehru personally met Tank and inspected the progress of the design. It is important to note that Nehru had no moral inhibitions in accepting the services of engineer who had worked for Nazis! Tank arrived in Bangalore in 1956 for the project and produced a first prototype by 1961. The production version of the aircraft was ready by 1967. India was the only country outside Europe and America which had achieved the capability to build its own jet at that point. Of course, one can say that the designer was imported. In total 147 Maruts were manufactured and inducted into IAF. Critical air support in the battle of Longewala by Maruts prevented Pakistani army overpowering India posts in the western sector. It is believed than 20 tanks and 100 vehicles in total were destroyed in the attack. This operation was later called a ‘Turkey Shoot’ due to the lopsidedness of the attack. Not even a single aircraft was lost in air to air combat during 1971 Indo-Pak war. This shows that the aircraft was reliable and maneuverable in complex combat situations. After the war, Marut became obsolete within a decade due to rapid technological developments in aircraft technology. Marut HF-24 was the peak moment for India’s defence manufacturing capabilities (as far as aircrafts were concerned) according to Bharat Karnad, a defence expert at CPR (Centre for Policy Research). Thereafter, defence PSUs did not get the attention and political support they deserved. As a result of this, India is forced to import technology and defence ammunition, aircraft, rifles and even ammunition from foreign nations. Recent deals with foreign manufacturer for technology transfer or local manufacturing may be touted as a boost to local defence industries. But these efforts are not equivalent to a truly flourishing domestic defence manufacturing industry which can develop and own all the technology used by our defence forces. Excessive bureaucratic control, lack of investment in research, negligence of military and political leaders has ensured that India is dependent on outside support for its critical defence requirements.